Winner of the 1987 European Touring Car Championship title, the charismatic driver succumbed at the age of only 44. Winfried Vogt, who was from Waldshut-Tiengen, was known for his competitive spirit. Almost universally known as 'Winni', he started racing in 1968 competing in hill climbs with a matt black DKW Junior, finishing second in his very first event at Schauinsland. In 1970 he switched to an NSU 1000 TTS and won 1973 the German hill climb championship. He had his first taste of single seaters with Formula V.
He didn't race between 1975 and 1977 but returned in 1978 to driver a VW Polo at Mainz-Finthen. He won and followed this with a couple of drivers in DRM with a Cavallo-Matras entered BMW 320 without success. In 1979 he did a full season of DRM with a BMW 320 as well as the Nürburgring 1000K race once again without any real success scoring eight points in ten races. Switching to a Toyota Celica entered by Postert Toyota Team did not bring a change to his results in 1980 though things started to improve in 1981 with a couple of fifth places and 3 seventh place finishes. In the first year of DTM 1984, Vogt took two wins with a Linder Rennsport BMW 323i finishing fourth in the Championship with 146.5 points. Vogt stayed with Linder in his second DTM season. However despite an impressive win on June 2nd at Mainz-Finthen, finishing nearly 52 seconds clear of second placed Per Stureson's Volvo (probably still the record for the biggest margin of victory in a DTM race) he could not match his previous year's achievements and ended up tenth. In 1988, Vogt once again raced for Linder in a BMW M3 but only at Hockenheim. 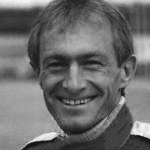 He joined the BMW factory team in 1987 racing in the European Touring Car Championship. He took the title with 4 wins and 2 seconds in seven races. He also make several starts in the World Touring Car Championship with F1 drivers Christian Danner and occasionally Mark Thatcher, taking a win at Spa and a second at Bathurst. Sadly he fell ill with cancer and though his health deteriorated, he continued until the end of the 1988 season the BMW factory team. He succumbed to his illness the following year.